Hetepu (Peace & Blessings) Family. I have had some people ask how I discovered Kamta and was able to make all the connections. Well, all I can say is that it was because of my ancestors. I like a lot of people had read and studied Kemetic history, lore and spirituality for some years but I was not able to make any headway. Then, things changed when I began working with my ancestors and asking them to guide me in my understanding (See: How to Distinguish between the Higher Self, Ancestors, Spirit Guides and lower self). What they showed me was that when the first Africans were brought to North America, they were taken from the Kongo-Angolan region and forced to work as indentured servants. Since the Kongo ruler had voluntarily converted to Christianity prior to the advent of the trans-Atlantic slave trade, most of the people taken from the Kongo-Angolan region were either Christian or at least familiar with the Christian faith and already had a working syncretism with their indigenous beliefs in place. Consequently, because these Africans had Africanized Christianity, it is believed by some scholars that the Portuguese and Spaniards called these Africans the pejorative term Judio (pronounced hoo-dee-oh) which is Spanish for Jewish referring to the Jews who continued to practice the Old Religion (Judaism) even after learning about Jesus Christ. The term judio was later corrupted in the English language and became what we call hoodoo. Although there are some authors who attempt to trace the term hoodoo to an African source, it should be noted that most African Americans never used the term to refer to their spiritual practice because in the African mindset. Hoodoo was considered a form of witchcraft, which was a forbidden practice. The term is totally a European creation that was used to describe early African American spirituality and in particular the Black Church. So, when the descendants from the Kongo-Angolan region arrived in North America they were stripped of all of their possessions. However, they managed to bring with them their dikenga commonly called today the Kongo Cross, which is a unique Kongo cosmogram that mapped the universe. Although these early Africans in North America were not able to syncretize their beliefs and practices under the guise of the Catholic saints as their kinfolk had done in Brazil, Cuba, Haiti and other parts of South America. Through the Kongo Cosmogram or Kongo Cross, our early ancestors managed to use the Kongo cosmogram to syncretize their beliefs with the Protestant Christian faith in order to create their own religion. They were able to accomplish this feat because the Kongo cosmogram like most medicine wheels could be interpreted in numerous ways depending upon perspective. For instance, the basic understanding of the dikenga or Kongo Cross is that our universe is composed of two worlds – the land of the living (above) and the land of the dead (below). 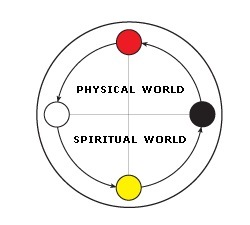 When human beings incarnate to the land of the living, his or her soul mimics the four movements of the sun – Kala (Sunrise/Birth), Tukala (Midday/Life), Luvemba (Sunset/Death) and Musoni (Midnight/Rebirth). However, if an individual was experiencing a lot of bad luck, failing health, grave misfortunes, etc., it was understood that the individual’s sun is setting or dying due to some impurity (or sin). In this case, it was necessary for the individual to travel to the land of the dead so that their ancestors could purify them and they could be reborn. Rebirth consisted of going to the land of the dead because the land of the dead called mpemba or the “land of whiteness” and purity was seen as a mysterious realm where one found great rewards. Allegorically the land of the dead or mpemba was believed to exist underground but could also be found where the land of the living and the land of the dead met like the plantation and the hush harbors, a city and the forest, a town and the wilderness, a municipal and cemetery, land and a body of water, etc. Now, what’s unknown to most is that for a long period of time, the original Black Church did not meet in buildings. No, quite the contrary. Our ancestors met in brooks, groves, hush harbors, etc. because slave owners, fearing that early African Americans were plotting a revolt, prohibited them from congregating. When the Second Great Awakening occurred in North America, that’s when a large number of early African Americans willingly converted to Christianity particularly the Baptist and Methodist denominations. Although, most historians are uncertain as to why this massive conversion took place, a thorough analysis of the Old Kongo thinking reveals that it was most likely because full body baptism (submersion into a body of water) was most likely interpreted as the passing into the land of mpemba. Remnants of our Old Kongo belief can still be found in the church today, which is the reason before adherents are baptized. They are instructed to wear white robes or garments. Another example of this philosophical thinking can be seen in the fact that most elders within the church wear white, and so on, which corresponds to the Luvemba moment – the setting sun – also the color white. But due to charlatans within our community, the commercialization and exploitation of African American spirituality by outsiders, the Black Church has become a hollow institutions that focused solely on religious entertainment. The loss of African philosophy and theology, combined with the passing of the elders unable to pass their spiritual knowledge to subsequent generations, has resulted in the steady decline of the Black Church. It was my ancestors that helped me to see that the people of the Kongo-Angolan region were part of the Bantu or Ba-Ntu tribal group, which archeologists and historians have found, once upon a time lived and dwelled along the Nile River. Because as the saying goes: there is nothing new under the sun. The remnants of the Kongo Cross in North America could be syncretized with the Kemetic Amun Ra system to create the maa aankh cosmogram. For the record, I had read the Story of Ra and Oset (Isis) numerous times. In fact, I read it so many times that when I saw or heard any mention of it. I just glossed over it because I did not seen any importance of it. But, it was my ancestors that led me to understand that Ra’s “Secret/Hidden” name was Amun (the Hidden) Ra. They later showed me how Amun Ra corresponds to the Moon, which was given greater significance then the Sun. It was through this understanding that led me to discover the Maa Aankh. The basis of the Maa Aankh cosmogram is that the world is composed of two lands called above TASETT (the Red Lands), which is ruled by Set, and KAMTA (the Black Lands), which is ruled by Osar – the owner of the white hedjet crown. When a human being incarnates to the land of the living or the harsh Red Lands, we must follow the path of Ra, which was discovered by Oset – KhepeRA (Kala in KiKongo/Sunrise/Birth), RA (Tukala in KiKongo/Midday/Life), RA Atum (Luvemba in KiKongo/Sunset/Death) and Amun RA (Musoni in KiKongo/Midnight/Rebirth). Similar to the Kongo land of the dead or mpemba (land of whiteness/purity), KAMTA is called the Black Lands because of the dark fertile soil due to the inundation of the Nile River, but it is an allusion to the mysterious spiritual realm of the ancestors. Hence, the reason the Kemetians referred to the southern region as the land of their ancestors and symbolized this region by the white Hedjet crown and the Kemetic ancestor Osar. The purpose of sharing this with you is because many of us (myself included) have been convinced that we were stripped of our culture and it is just not true. The whole purpose of telling us this is so that we never return back to our cultural way of thinking. There are all sorts of examples I could list to prove that we did not lose our culture. We lost the philosophy and theology behind our culture, which is the reason many talk about the ancestors but are afraid to work with them. KAMTA is the recreation of the brooks, groves, hush harbors, the forest, the wilderness, the cemetery, the underground, the lake, the sea and anywhere there is a mysterious reward including the deep recesses of the mind. This is where all of our answers and solutions come from, and why our ancestors met there to plot their revolts. So, don’t be afraid of the dark because this is where our ancestors reside. Excellent stuff. It is hugely enriching, particularly, to us who are on a journey of knowing ourselves. For many of us this a process of transformation. What is Kemetic Spirituality (Kamitic Spirituality, Kemeticism or Ancient Egyptian Spirituality)? Why they Attack Kemetic Shamans/Spiritualists? What is the Real Difference between Magick and Spirituality? Why They Don’t Want You To Remember You Are A God/Goddess? Help spread the word, become a fan!